Whoa, what happened to this place? Everything’s so dusty and gross. Why is there a pile of circuit boards on the bench?? Anyways, backing up a little in life, I decided to redesign Roll Cake from the ground up following my hub drive experiments earlier. MomoCon came and went, but the Hobbyking orders kept stacking up, so I decided to roll it all in with Überclocker’s changes for Dragon Con! It all begins with a wheel. 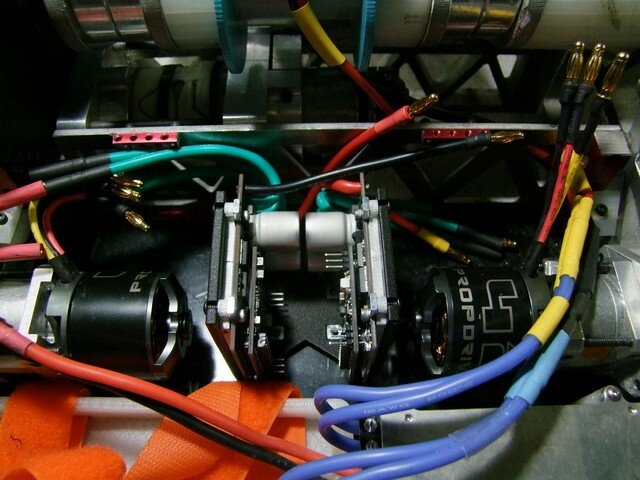 Doing the drive test with the SimonK ESCs and the Multistar 460kv motors convinced me that the hub motor direct drive would work out, at least better than the previous BS I tried to do. I went shopping for high pole-count, low Kv drone motors since they’re pancakey. The plan was just to approximate wrapping an O-ring as close as I could to the motor. 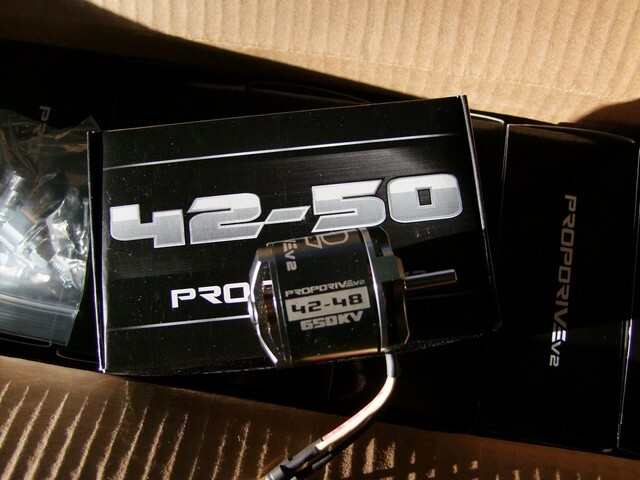 I ordered a few of these AX4006 motors for their combination of weight, low Kv, and high pole count. 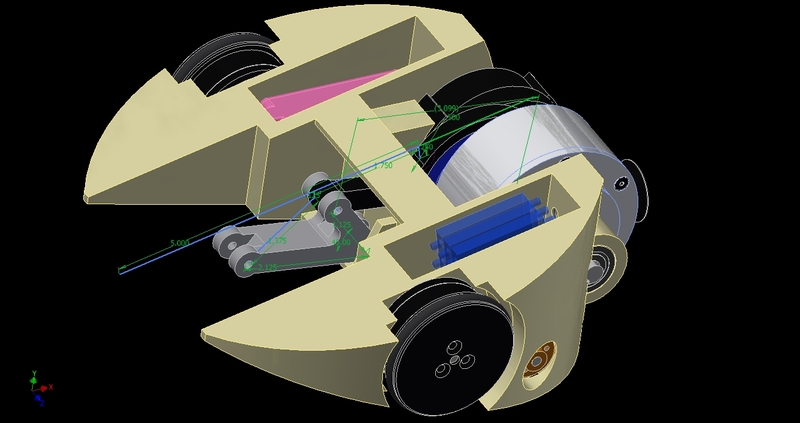 Roll Cake is a bot which faces some packaging difficulties, since the middle of the bot has to be left pretty open for the flipper linkage. 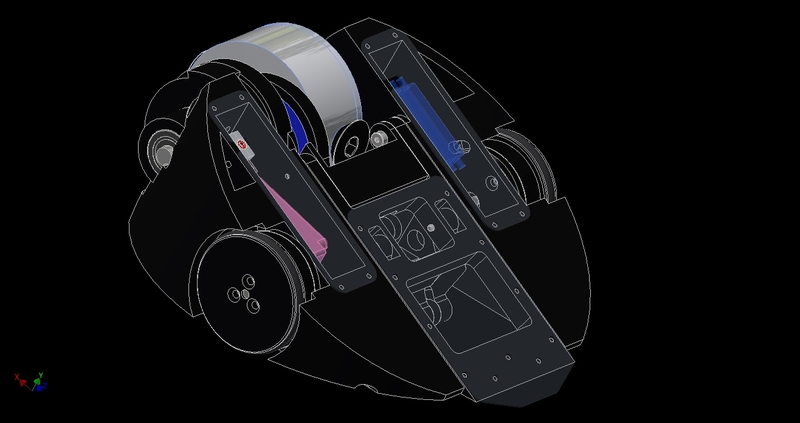 It would actually be easier in a 12 or 30lb design, since ‘noise floor’ of part sizes is much smaller compared to the bot size. 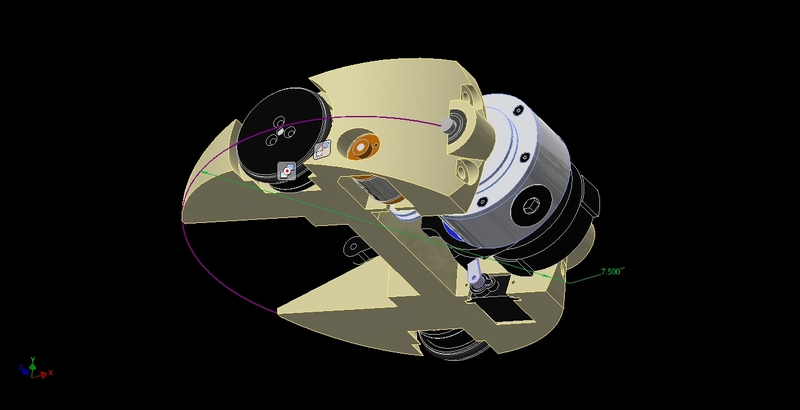 If I scaled this design up to a 30lber right now, those would basically be 6″ hub motors, which is unnecessarily large. …round. Remember that the flat sided shape was just an attempt at vomiting my vision of a bot that I’ve had for a while now, not making sure it works. When you ditch the need for 6WD, things get a little simpler! Even this is technically unoptimal packaging since there will be a lot of wasted space in the narrower parts of the cheese wedge. I’m basically just reskinning Roll Cake v1 and using all the same parts, since the goal is to get it driving and flipping things reliably, albeit not spectacularly, before deciding what aspect of the design to improve. Once I had the parts placed reasonably, I started generating frame features to accommodate, such as wheel cutouts and future bearing blocks. 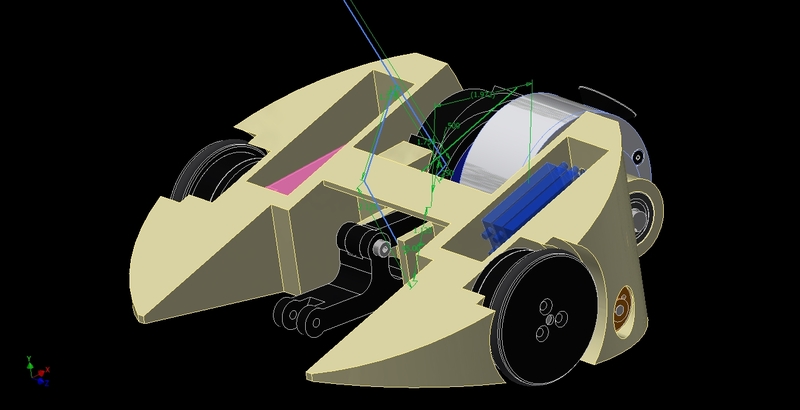 The chassis will no longer split in the middle – that required so much extra effort to get everything to line up. Instead, I’ll be splitting the rounded caps next to the bearings off as its own print in the future. 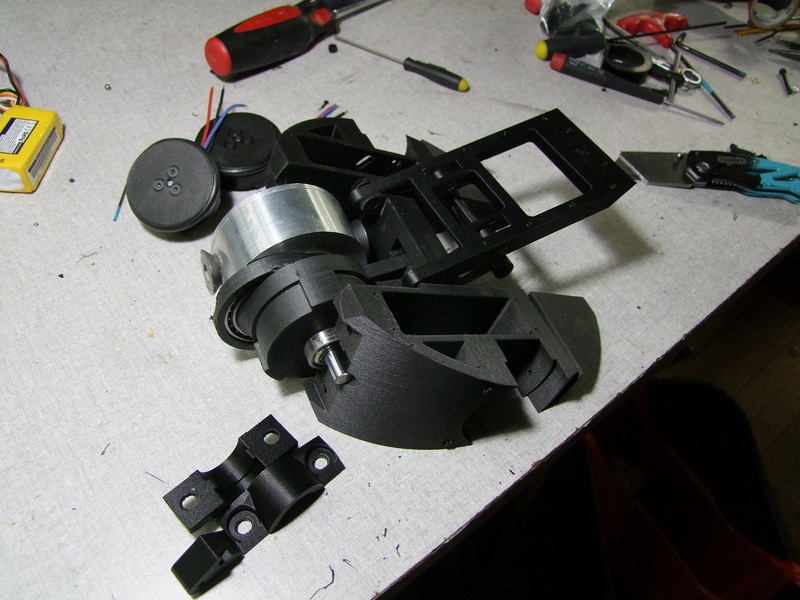 The previous image showed the old linear slider trigger, but packaging necessitated switching to a swinging style. This means Roll Cake won’t fire when upside-down with the drum running in reverse – I’d still have to ‘self right’ so to speak. That’s fine, since I’m also ditching the double-sided linkage due to it taking up the entire center of the bot from swing space. At least keeping the flipper single-sided lets it still have structure in the middle! The chassis is now taking shape pretty well, showing the swing trigger’s backing and “drilled” bearing cap holes and the like. I’m designing this to print ‘upside down’ on the flat top face. 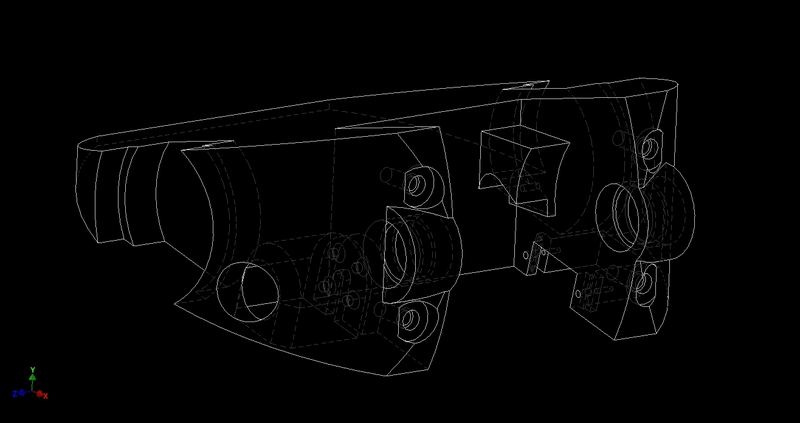 After defining critical part anchor locations, I hollowed things out to accommodate the flipper linkage and irritatingly rectillinear things like batteries. Seriously, if there’s one thing this design is sorely lacking, it’s a battery worth having. I much prefer this to be 4S, but can only fit a 3S pack of adequate capacity for now. After that, the fun part became linkage design. 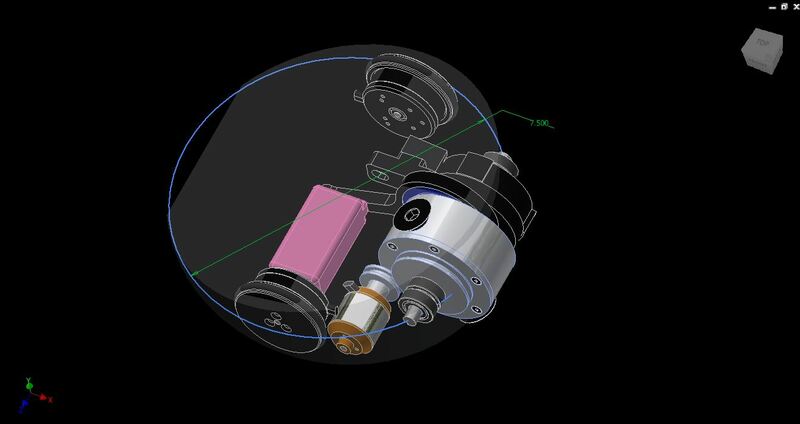 The goal is to get a linkage design which travels as far up as I can manage using the roughly 1″ throw of the cam ring, and generally has no linkage interacting at more than 45 degrees starting angle. 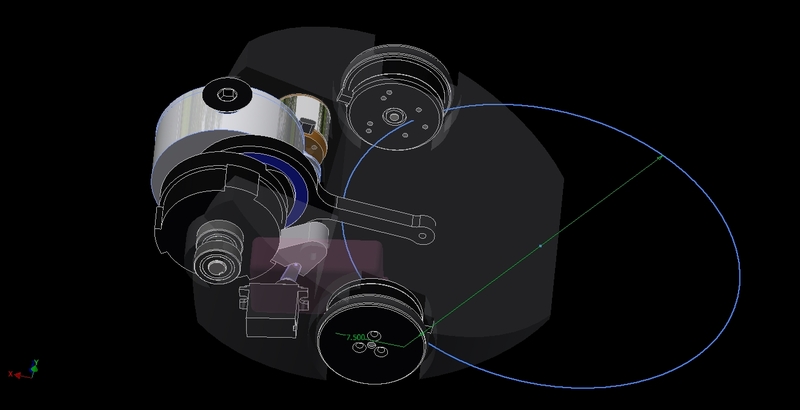 My insistence on a “pull” action on the main cam linkage means I have to transform the motion through a bell crank (the bottom and right side short line) to become an upward motion. Strictly speaking, I could potentially accept a push action from the cam linkage and that can directly interface with the flipper arm and move it upwards, but it would need to be designed much more heavy to stand the compressive force instead of tension (pulling) force. 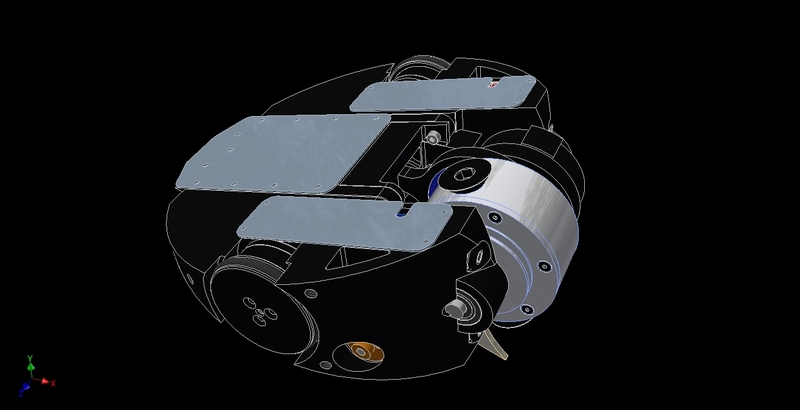 This bell crank itself went through a few revisions in order to minimize the impact it has on the middle of the bot, the large bulkhead that runs across the two sides. Here, I’m comparing designed linkage travel with actual part placement, seeing how much of the middle of the bot has to be cut out. 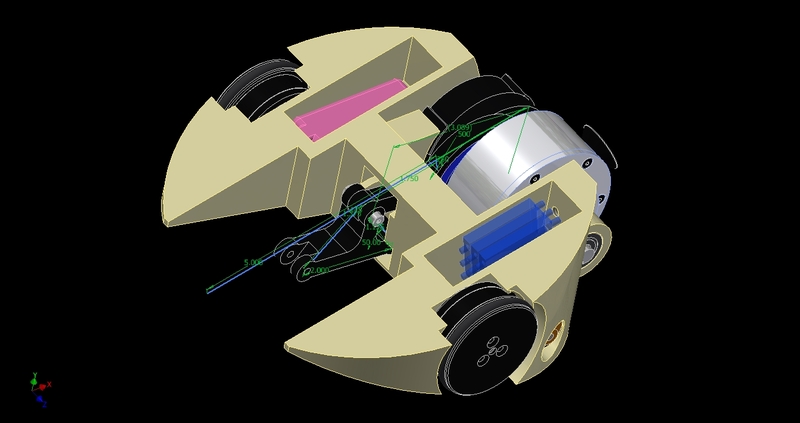 The bell crank center distances and topology have also changed. 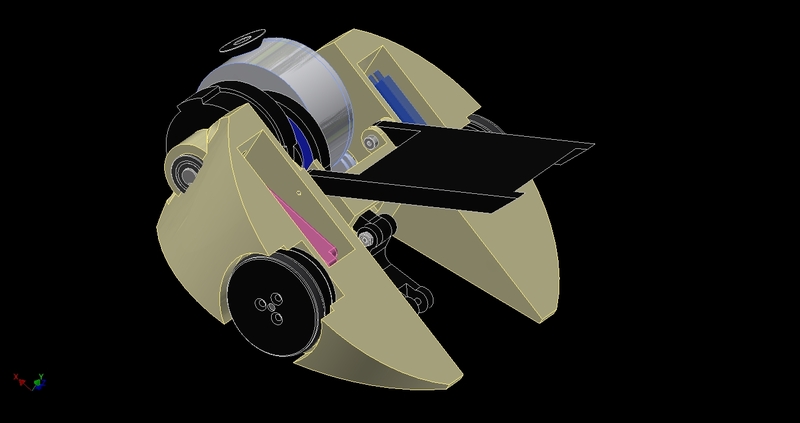 The previous design intruded on the center of the bot with its full height, whereas this “T” design means only the short leg of the T pokes through the center bulkhead. 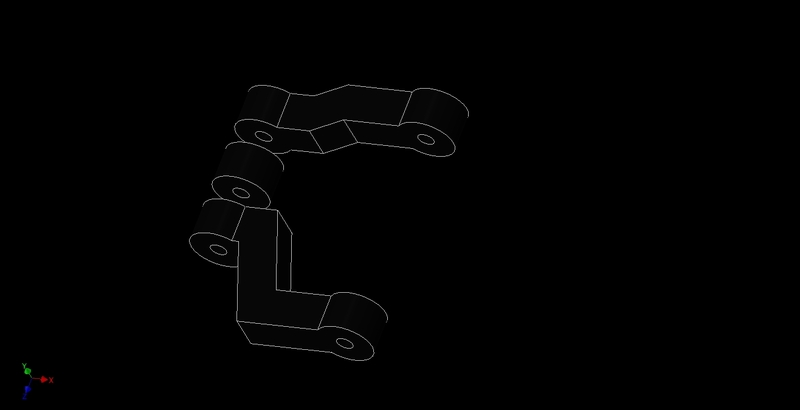 After I was satisfied with the bell crank geometry, I made a crude flipper arm model to start out with. The linkages will have to fold into themselves a fair amount, so I pre-emptively carved space for them before doing anything else. The intermediate linkage is a bit of an awkward shape – here it is taking form. 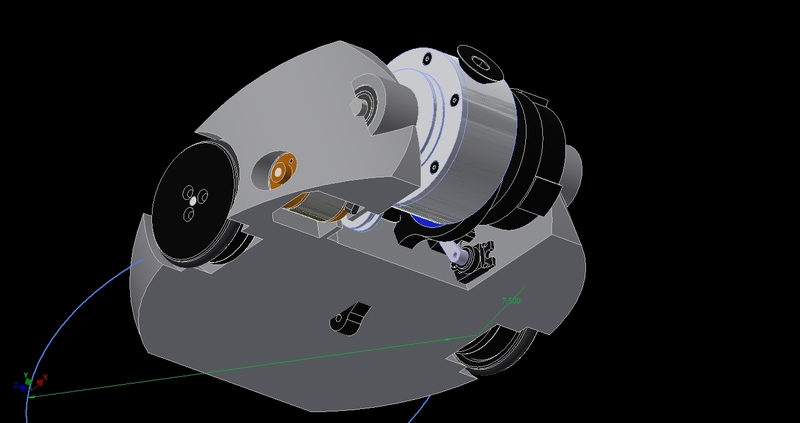 It has to adapt the narrow bell crank to the wide flipper linkage. I decided to do it here, and reinforce the middle of this linkage with a big flange, instead of trying to flare the end of the bell crank wider due to my desire to print it flat and have fully un-interrupted perimeters to maximize strength. Here, see the aforementioned flange in the center of the intermediate linkage. 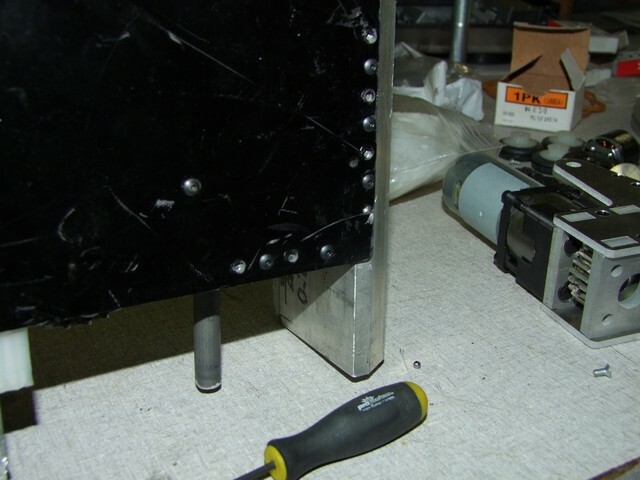 I’ve now hollowed the flipper arm, which will be top-skinned with hardened spring steel. 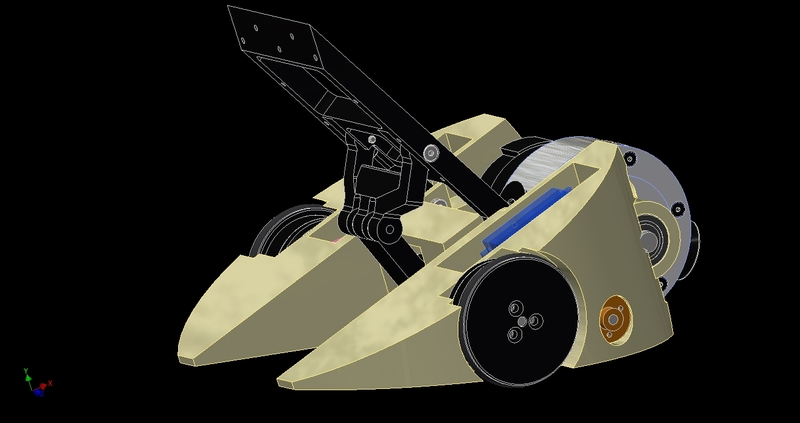 The armor for this bot is quite simple – primarily Onyx in massive hollow-ish sections for the crumple zone effect, and blue-temper spring steel covering the important parts and providing access hatches. I added a little feeder leg next to a region with unused material thickness. 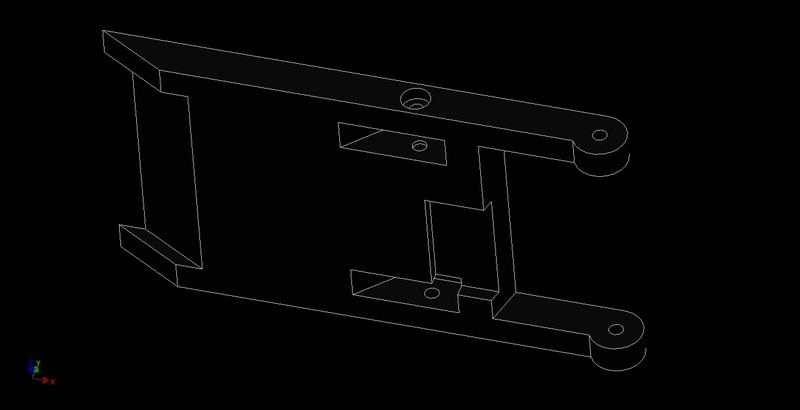 This will be a machined piece which is captured with nuts and flat-headed screws. Finished and ready for printing! I had to split the geometry first into the printable sections. 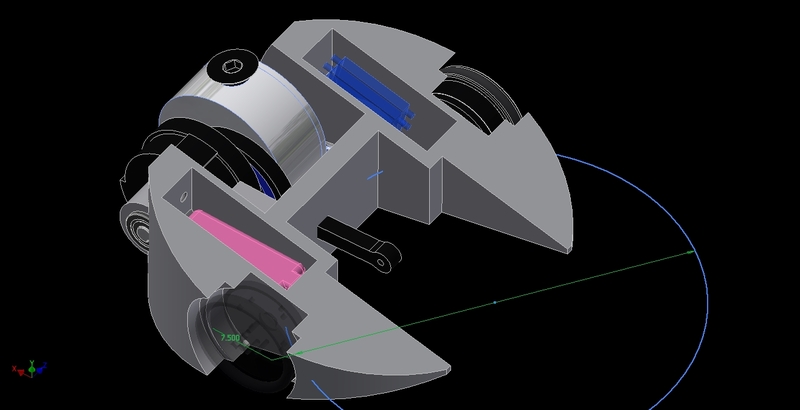 I extracted the bearing cap by making a 5-sided surface box in Inventor and using a split body by surface function. Only one was needed – the other was disposed of. 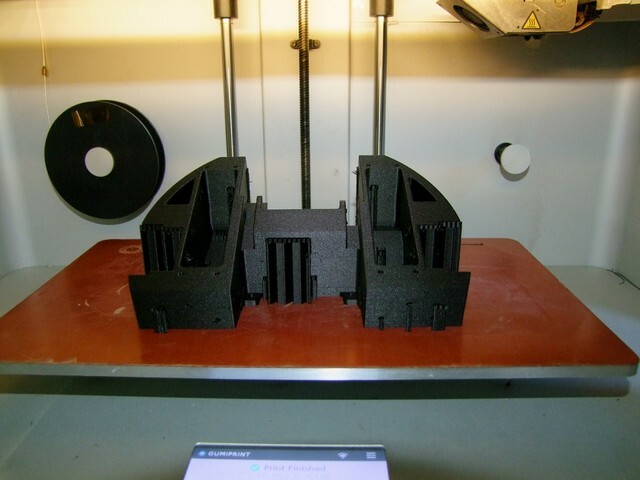 Other sections such as the mostly empty tail were cut off also in order to reach the print volume, and they were designed to be bolted back on. A day later… Her’s the frame finished, printed in 3-perimeter 50% density Onyx. Ought to be plenty! You can see where I cut the end of the wedge off and have modeled in a few tappable holes to hold them on. Here’s a pretend-o-bot to make sure the dimensions all fit. The bearing cap was something I was particularly nervous about. I didn’t design clearances into the linkage parts to save design effort (read: I’m too lazy to make proper constraints) so some filing was needed to get them sliding freely. Hardware installation time! 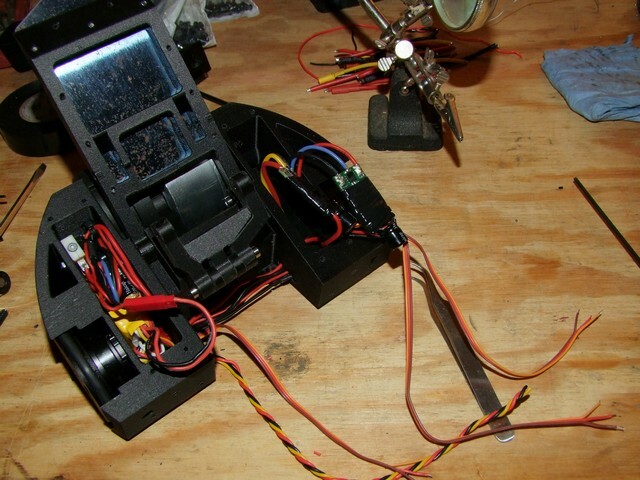 I made sure to make little access ports for the motor wires, because wouldn’t that be embarrassing? We move now to my old high school workbench down in Atlanta, which is somehow still there and in operation (maybe being 16 feet long has something to do with it). I got all the mechanical hardware installed before leaving, and decided to save the wiring for the Dirty South. Pictured in the foreground is my new best friend: the itty-bitty-baby-offset-screwdriver-bit-ratchet. It’s McMaster part number 52725A31, and it’s positively adorable AND the only way some screws on Roll Cake are accessible at all. I designed it this way, so it’s legit, right!? As usual with this thing, wiring is a disaster. The ESCs of choice are the Afro 30 Race with SimonK set up to do reversing with my usual tricks. They’re small, but not THAT small. I decided to keep the ESCs on the same side of the bot as their motors in order to reduce the amount of long wiring runs, so there’s two on the right side of the bot and one on the left. 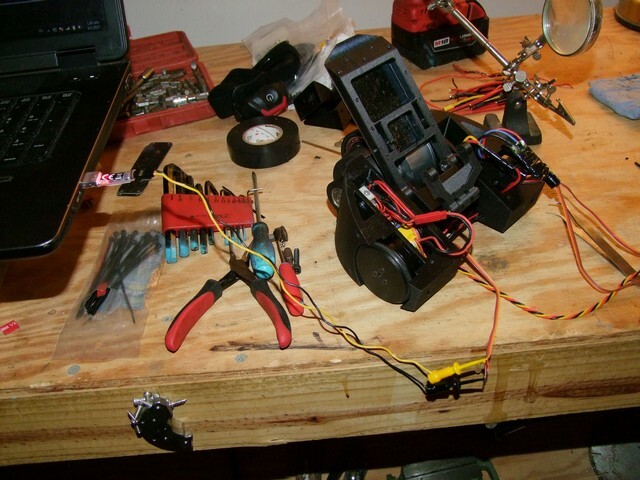 All the motor connections have now been made, and I left one task for last before I soldered the 3-pin signal wires to the receiver…. I had to program the SimonK firmware to activate reversing and braking and my preferred goodies. I planned ahead and made this servo to tiny-clippy-jiggle breakout cable which I’ve termed “The Simonator 2.0″ in order to grip the signal wires of the ESCs. While I could have programmed them all beforehand when the servo conectors were all still there, I decided I needed this cable regardless just in case I had to change something in the field, post-installation. I brought the finished bot to one of the robot panels at Dragon Con. Sadly this year I fell off the bus and did not host any panels, but I’ll make sure that changes next time! I’m glad that recently, my Makers presentation hasn’t really been needed – in the most recent years I delivered it, the percentage of the audience who’ve experienced CAD or soldering LEDs together, etc. has grown immensely, in my opinion greater than the rate of self-selection for these things. Here’s the linkage fully opened! Note the preponderence of little shoulder screws forming the joint pins – I standardized all of these to the same length to save myself from my historic habit of making my robots all shoulder screw nightmares. I’ll post some of the test videos of Roll Cake soon – I was happy enough with its performance in the garage in terms of drivability and flipping, even if it won’t prove that impressive in the box due to being repackaged test rig parts. Pretty depressing, eh? In the final rumble of the 30lbers, I burned out one of the SK3 4240 drive motors, so I was on the hunt for replacements, and Hobbyking didn’t have stock in that size at the time. So I scored a couple of these – they were physically the same dimension, but unfortunately these motors were slightly faster again, so I was facing the very real prospect of Clocker hitting 25mph without much provocation, which could be a liability on the Dragon Con stage. Good thing Clocker is legal in the new 30lb Sportsman’s Class rules enacted FRESH AND NEW this year for the Franklin Institute event in 3 weeks! 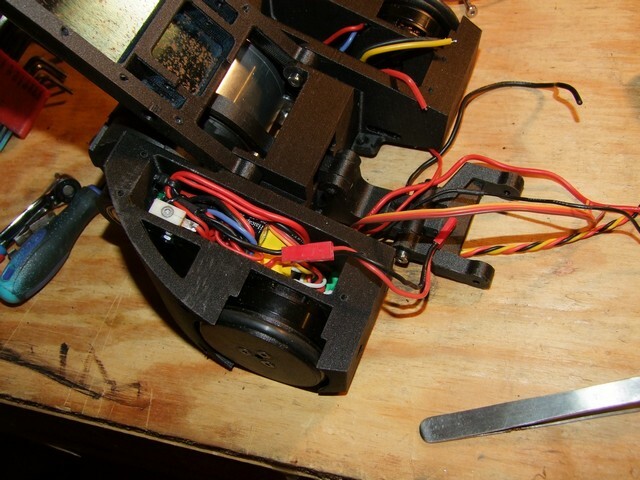 To extricate the motors, I had to disassemble the frame, which proved a little…. challenging after Glasgow Kiss gave it a once-over. There were some special extraction techniques I had to use here on this machined corner! 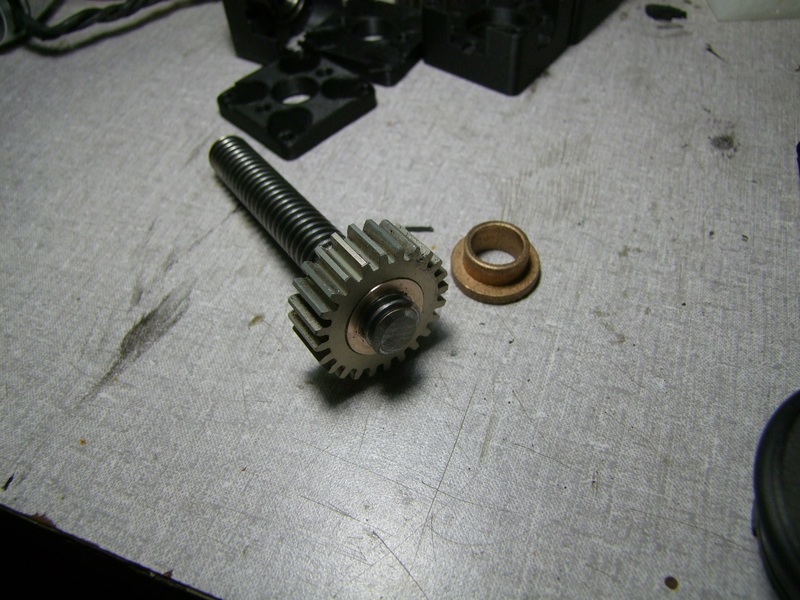 From the spare Clocker parts bin I extracted another section of the 1/2″-10 leadscrew and flanged bronze nut that fit it. I’d bought a few spares last year in anticipation of needing to machine them eventually, and here we are. The bronze nut gets machined all the way down to be smashed into the bore of the modified Vex Pro spur gear. When the gear spins, the leadscrew gets sucked in and out of the nut, and its own reaction forces are taken up by the bronze bushings surrounding it. All solid, all friction, all the time, but it gets the job done. Mate this up with new waterjetted plates that I drilled and tapped and we have a new actuator. 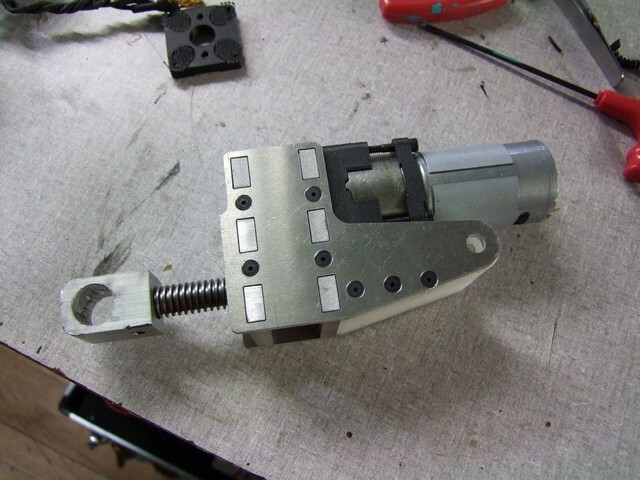 The drill gearbox was reassembled from stock pieces from my giant decade-old (…) bag of Chinese cordless drill parts, using the original shaft which was not damaged in the fight. I have enough pieces now to straight up make two whole actuators, which is nice. After that, I repaired the bottom plate of the bot by stitching new holes in between the hole ones. 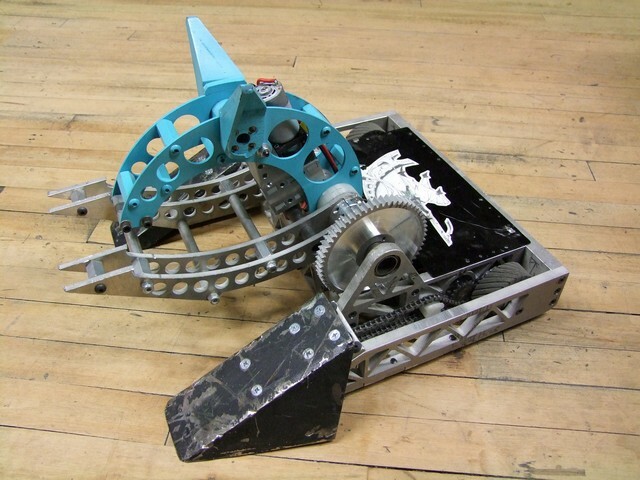 I’m not sure if I’d use #4 screws like this anywhere in a loadbearing path (which the top and bottom plates do count as) if I redesigned Clocker again, since the indirect shock loads from the 30lb Featherweight class alone (in the form of getting socked by a spinning weapon) is much higher than Sportsmans. One of the corner hits from Glasgow Kiss sheared off a half dozen of my bottom plate screws just by momentarily bowing out the frame enough. While I was in there, I swapped in the spare wheels made from 60A Mystery McMaster Urethane (actually OEM’d by Forsch Polymer, the most 1997 company extant in 2017). The white Smooth-on Simpact wheels had worked well enough, so I wanted to see how these would do. Well, everything is technically ready for reassembly! I rememberd a much better way of taking the entire top off Clocker. 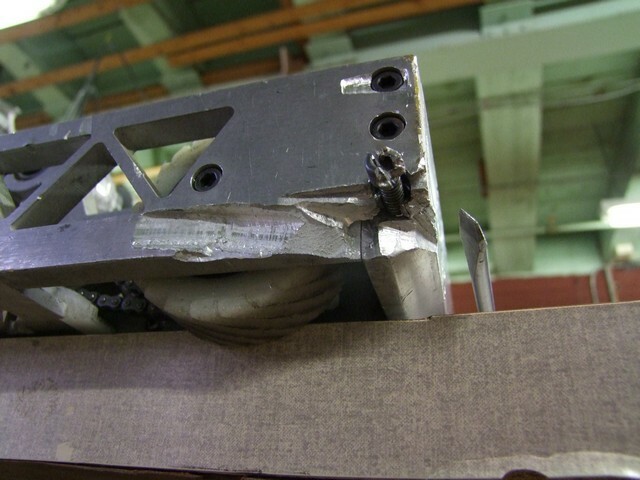 Previously, it involved trying to drive the center lift shaft out through ALL of the components that were shaft collar’d onto it. This was patently painful. 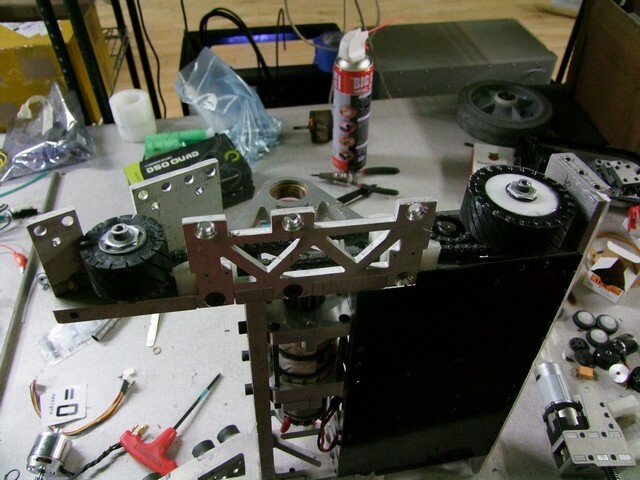 Unlike Overhaul’s unboltable lift towers, Clocker has solid ones built into the frame rails. It turns out if I just unbolt the outer and inner frame rail on one side as a unit (9 screws), there’s enough room to wiggle the shaft out of the bearings and pop the whole thing off. 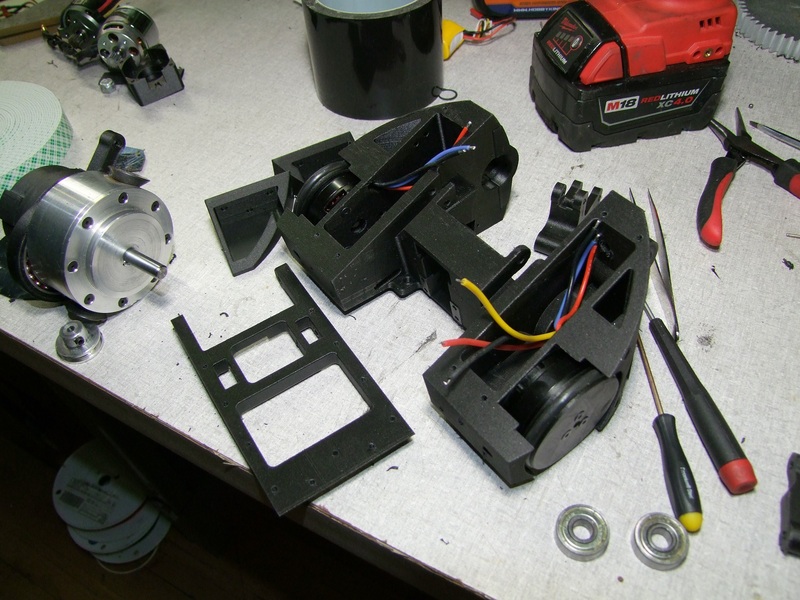 Clocker was the last thing I wanted to put the Brushless Rage test units in before shipping them off for production. The severely under-geared high-Kv motors will be a good stress test for the architecture, since on the Dragon Con stage I’ll mostly be driving at low speeds and turning/reversing often. Check out that little Onyx bracket I made to hold the units. I wanted to place them flat against the frame rail behind them here, but this arrangement kept the wiring cleaner and away from the outrunner motors. 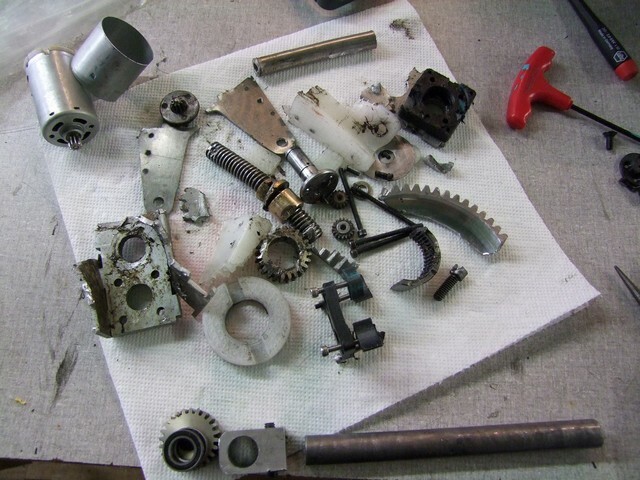 A new waterjet-cut gear and some quality Taki-time later, and everything is now back together. I did some drive testing outside, which showed me that the Brushless Rages were working great even under duress – the gearing on the motors is low enough that the bot has trouble turning in place on a high traction floor. So here I was hoping that it would be even able to turn at all on the Dragon Con stage carpet! But once it takes off… boy does it want to keep going. Welcome to Dragon Con! Have a van. I would have loved to bring ＶＡＮＴＲＵＣＫ instead this year, as it has been now impeccably reliable after its lobotomy and subsequent headcrab installation, but could not even begin to justify the 9 miles per gallon each way. It’s beginning to dawn on me that the kind of person who would have bought one of these things new, never ever thought about the cost of fueling and ownership. I’m not quite to that level in life yet. On top of that, it’s become more of a yearly reunion for some of the BattleBots competitors and friends who have moved around the country & world. For example, I found Lisa Winter! The cotton candy committee has arrived. 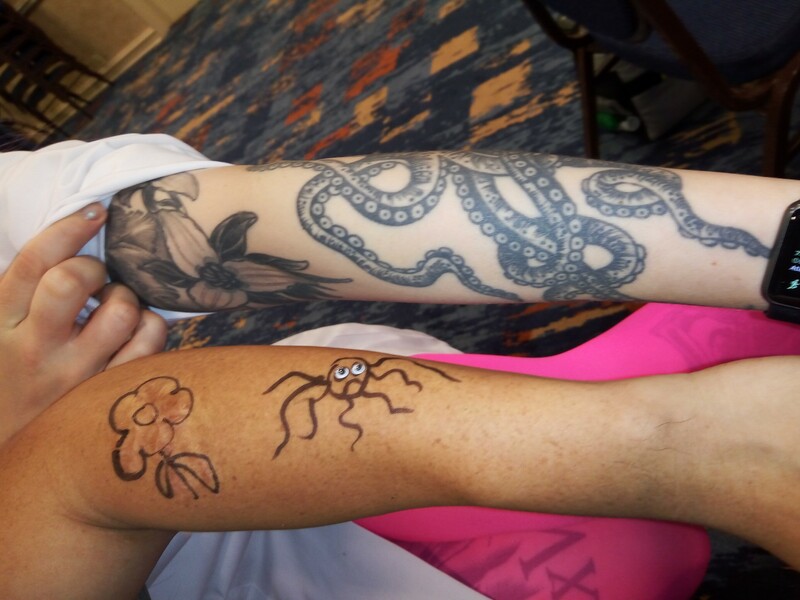 I attempted to replicate her tattoos in the middle of talking at a panel. Nailed it!?! 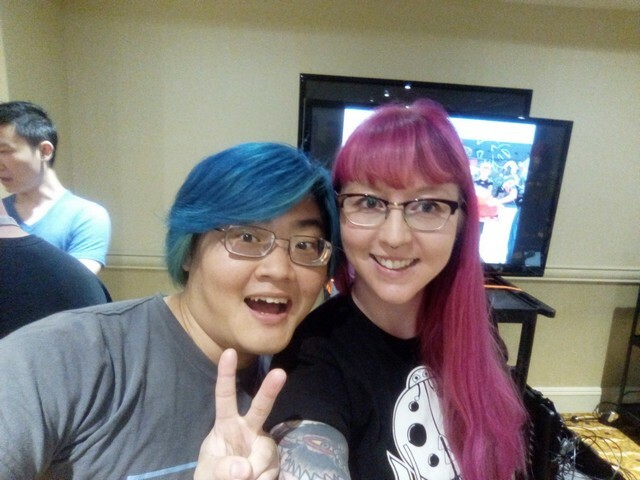 And for the first time in probably over 10 years, I actually played in a gaming tournament. 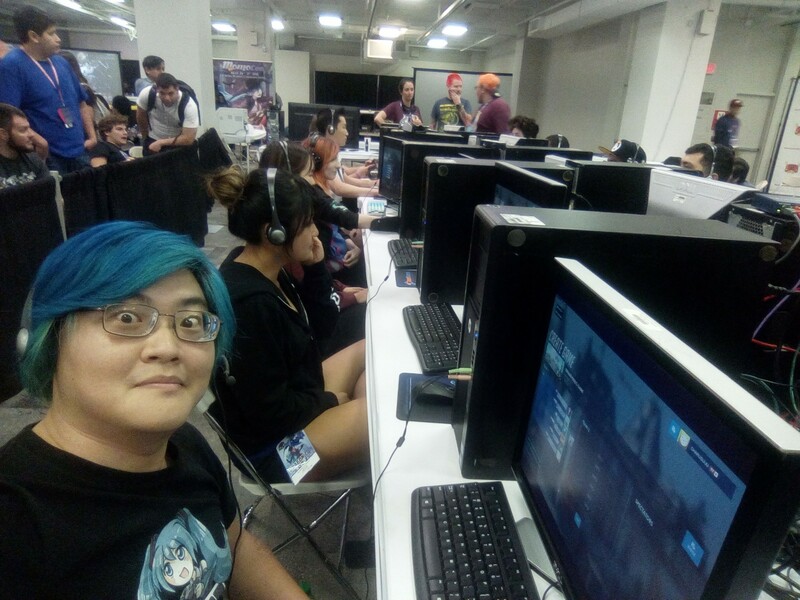 There was an Overwatch ruined my life run away now tournament being hosted at the convention gaming center, and a few of us essentially set up #BattleBotsPlaysOverwatch. The house equipment was sub-par, though, so we didnt’ do too well – people who have clearly been to more than one tournament brought their own mice, keyboards, headsets, and pillows and stuff. Now that’s pro. Alright, you know how Dragon Con goes down. Let me spare you the details and get to some robots! MicroBattles has grown to the point where it has to be single eliminations only and running across two arenas to keep up. I’m glad that it’s a good problem to have! However, it does mean you’re pretty much one-and-done. There wasn’t much to do with Roll Cake beforehand except get some driving in. 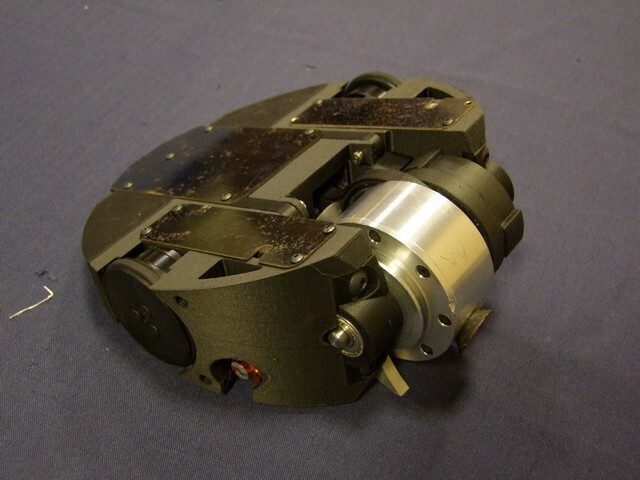 I decided to move the tail on the flipper downwards one mounting bolt such that it was more likely to rest on the floor – otherwise, the bot tipped abouts its wheels a little. However, it kept weight on the feeder wedge, so that was a plus. Robot Battles features mostly local builders who kind of keep to that series of events around the Southeast. It’s refreshing to see bots which haven’t been forced to become the small monolithic dense bricks that most competitions have forced them into being. 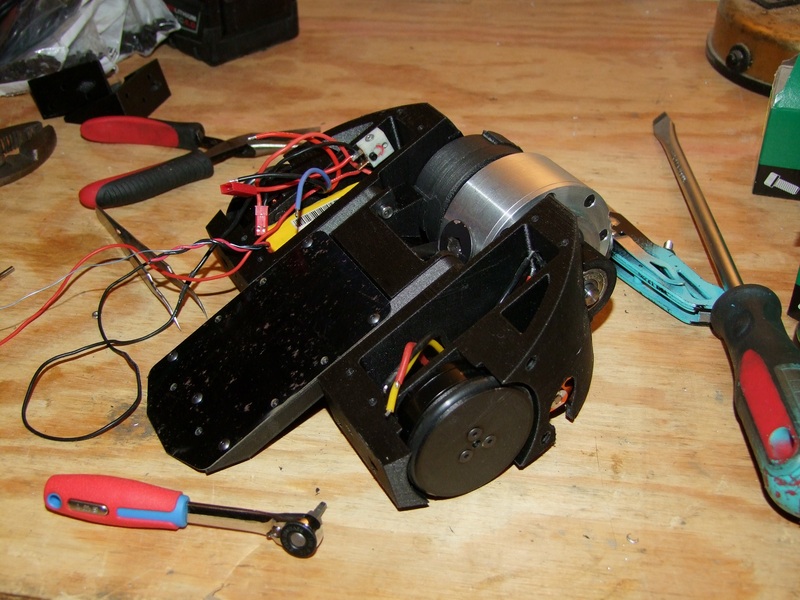 These two, for instance, are hand-bent sheet metal from Home Depot, with a hand-soldered custom motor driver inside. I honestly miss these kinds of builds. Pool noodle wheels were fully in fashion this year, made popular by the Dale robot Noodles. Hey, they’re totally not entanglement devices. The wheels aren’t supposed to come off, just incidentally if you hit them with your spinning thing! Wink wink. I suspect this kind of thing might get roundabout-banned somehow, but on the other hand, it’s 2017 – get a reversible ESC on your weapon already! Sheet metal everything, down to the weapon! Now this is robot fighting. I was pretty eager to fight Noodles since it’s high ground clearance and invertibility would have made for a whole match of flips with Roll Cake. Besides the wacky builds, you had your usual array of kit-bots and modified kit-bots. Roll Cake was matched with Margin of Safety first, obviously a fight that I was hard pressed to win. Aaron put on the miniature vertical drum module for the match, so we went head to head trading blows. Margins having the the smaller drum advantage, Roll Cake got flipped over and I spent a while trying to self-right, but at the time didn’t have any skids on top of the bot, so I trundled it around a few times trying to get him to flip me back over. See the two little hex nuts sticking up from the top? That was added after this match so I could get flipped over in the rumble and maybe get back up. With the drum bouncing off the ground, it wasn’t going to get enough momentum to roll it self back over, so after a while of trying, I decided to save the effort for the rumble. In said rumble, the drum promptly threw the rubber o-ring belt and jammed as soon as it started. Well bugger me with a #1/2-20 tap, that sure didn’t come up in testing! So I spent the whole time running around like an idiot. I suspect that spinning up quickly made the belt stretch enough (since rubber cord doesn’t have a tension element in the middle like fibers) to jump out out of the pulley enough to get grabbed by the drum. In Roll Cake 1, the pulley spacing was far enough apart that it would have just fallen off, but this time I had to move the drum closer and so there is a lot of overlap with the drum iself. Hey, all things considered, I walked out with a working bot. It’s now time to get serious with Roll Cake. I’m extremely confident in the mechanism now, and so it’s time for it to stop being a test jig on wheels. 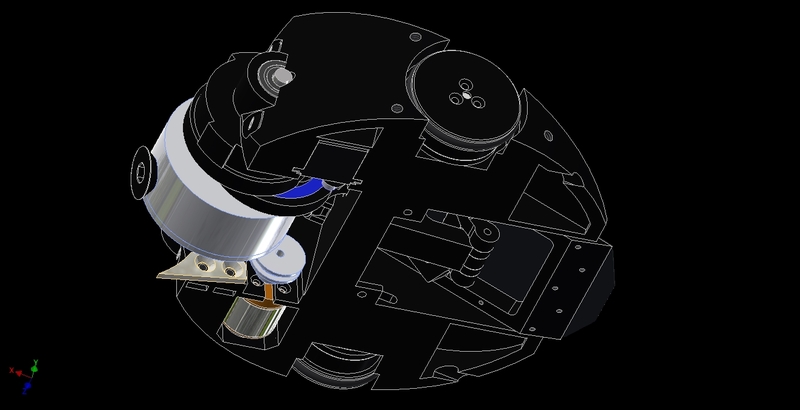 The weapon motor is severely undersized – if there was one design which should have a motor-in-drum setup, it’s this one! And, furthermore, freeing up the space occupied by the weapon motor might mean I could use more conventional drive motors. The hub drive worked well enough, but I still prefer the positive feel of a geared motor. With the return of all the robotty TV shows, we’ve seen a serious and sustained rise in the audience count. 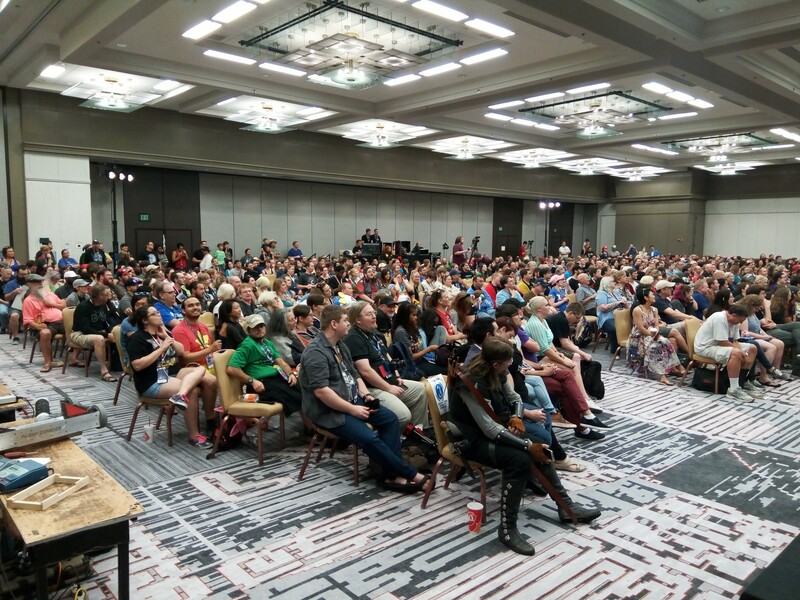 The room filled up to this level well before matches began, and the line continued out the door the entire day. An entry being finished in the pit area before matches begin! How quaint. Lisa brought itty-bitty Tento, weighing about 8 pounds, and entered it in the 12lb class for fun. This thing was built as a “how to build a robot” demo piece. 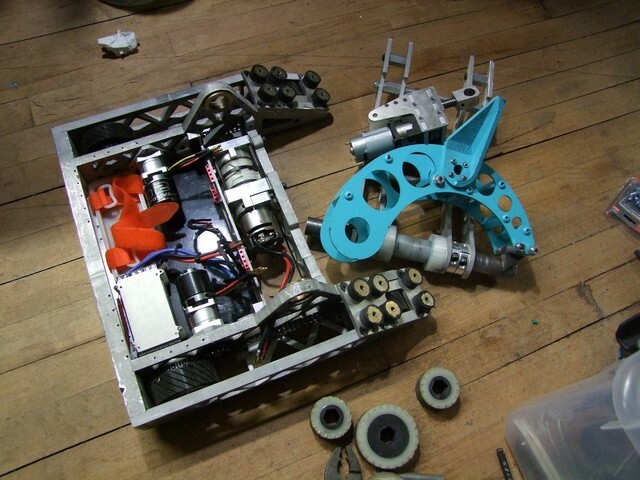 Unfortunately, it suffered a gearbox failure literally right before matches began and it was of a type that nobody else was using, so spares couldn’t be located. Sad day – maybe next time! Clocker just needed battery charging (and the replacement of a chain tensioner block) this whole event, so I’m quite pleased. I only ended up having two matches – one against this giant purple thing (which had radio problems at the end – notice us both running onstage to disarm it), and the second against Dale’s Pushy Grabber. This thing has been sweeping RB events (literally) with the lynchpin strategy of wiggling under your bot almost no matter what. Now, normally I offer at least some resistance to Dale, but this thing I had to approach either at a very specific angle or risk getting plowed off the stage almost instantaneously. We had 4 total matchups, in the middle of which Dale had to reattach one of the rollers and I had to replace a chain tensioner block which finally decided to wear through and fall off. This event really showed that, much like my arena-optimzed Test Bot v4 days in the Late Aughties, wide ground-hugging wedge surfaces really are more of a liability on the stage than an asset. Notice how in the final Pushy Grabber matchup, I tried executing the same strategy, but got hung up on the edge just long enough to become vulnetable. 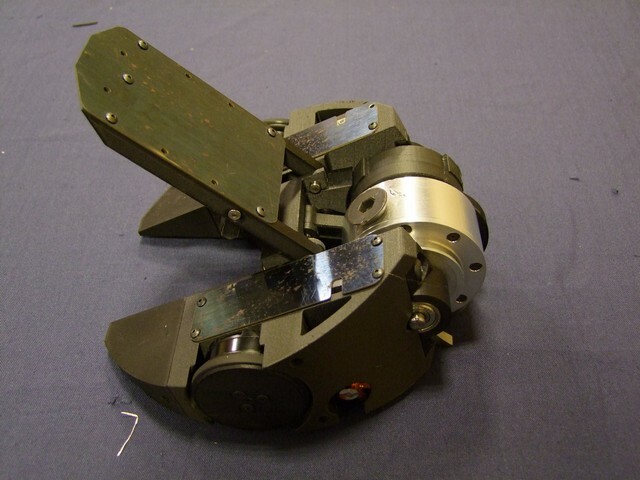 The only weakness of Pushy Grabber right now is a long-reach forked robot like Nyx with the lifter attachment – Clocker did not have enough “stickout” to really get a good handle on it – nor did it really on other bots. Unlike version 2 and 3 where the clamp arm reached all the way to the end of the forks, this one for the sake of looking more like Overhaul has the ‘grab point’ more inwards, so I had a harder time getting opponents into the clamp in the first place unless I took a straight run at them with some velocity – upon which I would often run into the stage edges. I stuck around for Rumble #1 which I won by virtue of trying to get around the damn stage and mostly ignoring opponents…. and in Rumble #2, I just took the wedges off and ran around like an idiot some more, accidentally handing the win to the purple thing after doing some kind of J-turn rocket jump off the stage. Oops. This event was also the final straw for me in terms of gearing down the drive motors more. I’ve been threatening to go to 2-stage gearboxes for the drive, and now it’s more necessary than ever. Clocker v3 was geared for 19mph and was already a rocket, and there was barely any need for it on the stage. I’ll probably move to 11:1 2-stage P60s and use smaller 35mm drive motors. Yes, this kind of thing is legal here, with a catch: It doesn’t exceed either 500 RPM, or 20 ft/s edge speed. 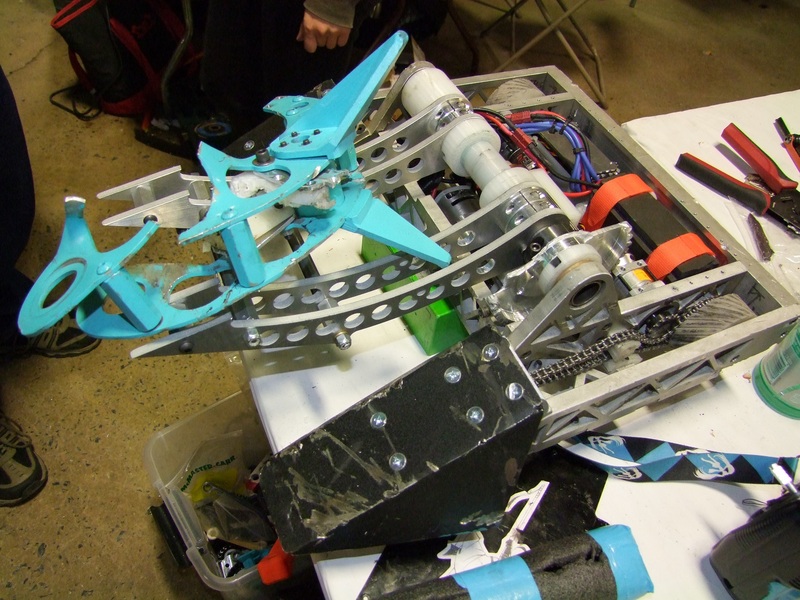 It’s driven by a geared motor, so it will more lift your bot up and chew at it. Replicas of BattleBots entries are the in thing right now! This is Tuskin Raider, a 12lb Razorback-alike that Jamison built. It got all the way to the 12lb finals. This is a 12lb shell spinner. And here we have the assembled Power Rangers shot of all the scale models. Hey, we can film #season3 right now if we just get all the cameras up really close. I keep bugging Jamison about why he didn’t make Tuskin a 30lber instead of a 12lber. So that’s it for Dragon Con! 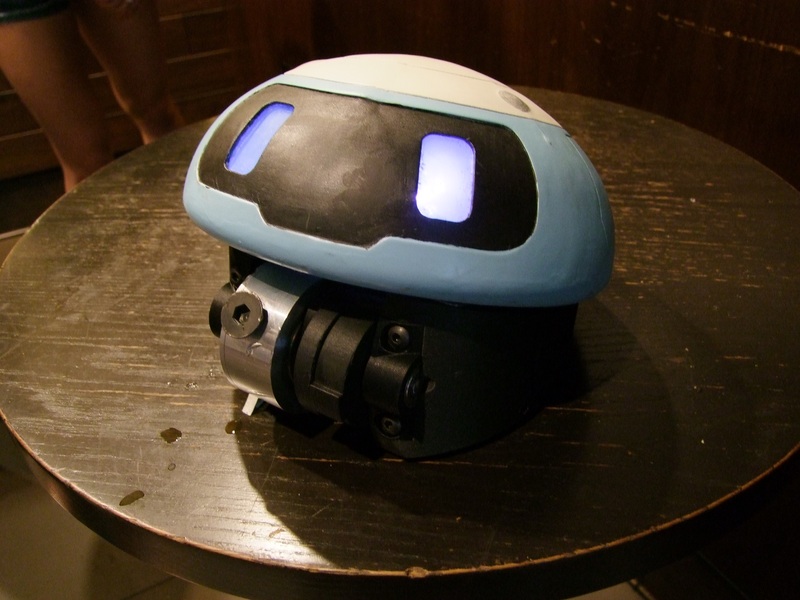 Two working robots remaining, shenigans abound, and…. no van adventures. Wow, when did my life become routine? Obviously it’s time for another all-vans update soon…. I want to build my own linear induction motors (because I can’t find any) and I hope you have some tips for a total newb in the motor building game. This is to eventually build a planar motor configuration, but baby-steps first. 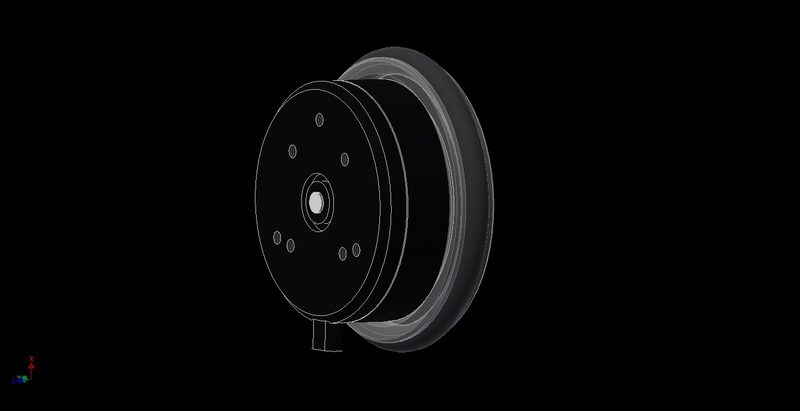 I was for instance planning to 3d print my equivalent of a stator (where the windings go) with iron filled PLA. I’m also looking for away to get a feel for the amounts of current I need and gauges of wire so I was thinking of finding a simulator that can help me figure some of these things out. Theme created by miloIIIIVII | WordPress | Entries (RSS) | Comments (RSS) | 32 queries. 0.321 seconds.